California has been shaped by tectonic plate activity and volcanic action and is a region isolated from the rest of the country. As a result, it is a region of distinctive geologic features … With a rich and unique human history of American Indians, explorers, settlers and entrepreneurs. 00:03:46California's oceanic coastline, including magnificent haystack formations, the Farallon Islands, California's Channel Islands, inter-tidal regions and the Farallon Oceanic Plate are presented in this chapter. 00:04:12The Klamath Mountains and the Cascade Mountains, including the California peaks Mount Shasta and Lassen Peak, as well as a look at Cascade volcanoes are examined in this chapter. 00:01:17This chapter presents California's Coastal Mountain Ranges. 00:01:19California's Mediterranean climate, including her magnificent redwood forests and Tule elk, are shown in this chapter. 00:03:56This chapter examines California's Sierra Nevada Mountain Range, also known as the Sierras, with emphasis on Yosemite National Park, and her monoliths - Half-Dome and El Capitan. 00:01:55California's Transverse Mountain Ranges include the San Rafael Mountains, Sierra Madre Mountains, Santa Monica Mountains, San Gabriel Mountains, and the San Bernadino Mountains, which have interesting chaparral ecosystems. 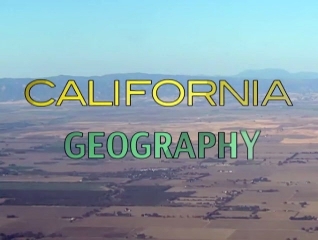 00:01:31This chapter presents the California Peninsular Mountain Ranges. 00:02:30Modoc Plateau and the Medicine Lake Volcano are presented in this chapter. 00:03:10This chapter presents a few of California's important agricultural valleys - the Central Valley, Sacramento Valley and the San Joaquin Valley and the California's river system made up of the Sacramento River and the San Joaquin River. 00:01:45Sonoma Valley and Napa Valley make up the California wine industry. 00:00:59This chapter presents the Salinas Valley. 00:02:38Basin and Range, which includes the Great Basin area of the U.S. is rich in mineral wealth and contains the mining ghost town of Bodie, California. 00:01:37The Mojave Desert, defined geographically by the presence of Joshua trees, contains Joshua Tree National Park and Death Valley National Park. 00:01:32The Sonoran Desert is the only place in the world where the saguaro cactus live. 00:01:25In the Colorado Desert lie the Salton Sea, the Imperial Dunes and the Imperial Valley which is irrigated by the All American Canal. 00:03:07This chapter presents the Los Angeles Basin which contains the sprawling city of Los Angeles and Hollywood. 00:03:01The San Francisco Bay is one of the great estuaries on the planet and contains three major California cities - San Francisco, Oakland and San Jose. 00:01:39In addition to the Colorado River, which runs through the southern tip of California and contains Hoover Dam, and Parker Dam, and provides water for California irrigation, California also has the fresh water lakes, Mono Lake and, Tule Lake. 00:05:21California earthquakes, are a result of plate tectonics, including the Pacific Plate, North American Plate and the San Juan de Fuca Plate which affect the San Andreas Fault. 00:03:09California's capital is Sacramento and it has three large coastal cities, San Francisco, Los Angeles and San Diego, while its Silicon Valley has spearheaded America's entry into the electronic age. 00:01:57The M Modoc Plateau has superb evidence of California's Paleo Archaic Indians and Archaic Indians. 00:03:23California Indian Tribes entered the California Formative Period, where they formed complex civilizations; and later were visited by a Chinese Monk named Hwui Shan in 500 A.D. and later Paiute and Shoshone tribes came to the Great Basin; and much later the Spanish Mission system destroyed these cultures and left in their wake the Mission Indians. 00:01:42Spanish Exploration began when Juan Rodriguez Cabrillo landed at San Diego, then 200 years later Spanish American colonies were founded in California. 00:04:27Spanish Mission, Alta California, also known as Upper California, was north of Baja California, and it was here that the Spanish Missions were begun by Father Junipero Serra, who founded the Alcala Mission, also known as the San Diego Mission, before setting up a series of missions along the El Camino Real, The Royal Road. 00:03:53Americans came to Alta California, or Mexican California, using the California Trail, which was dangerous and was site of one of the most infamous tragedies of the period, the Donner Party. 00:02:14The California Bear Flag Revolution during the Mexican American War created the, California Republic. 00:05:24James Marshall discovered gold in the Sierra Nevada Mountains and started the California Gold Rush, which created boomtowns like Bodie, California. 00:01:00This chapter shows how Chinese Immigration led to California Chinatowns. 00:01:03Among California Hispanics, Joaquin Murieta, was one of the most famous. 00:01:47California statehood happened in 1850. 00:02:30California learned of the start of the Civil War by the Pony Express. 00:02:38During California's Wild West, Wells Fargo was founded in San Francisco. 00:02:11The Pacific Railroad Act authorized the Union Pacific Company and Central Pacific Company, led by Leland Stanford to build the Transcontinental Railroad; and the railroad through the Sierra Nevadas was built by Chinese Americans. 00:02:14California's Indian Wars included the Mariposa Indian War, the War for the Redwoods and war of the Modocs le by Captain Jack. 00:02:38Aided by Chinese immigrants, 19th century California Agriculture began in the Central Valley and along the Sacramento and San Joaquin Rives and would eventually lead to the California agribusiness. 00:01:31California's Japanese immigration began in the 1880s and would lead to Japanese Americans becoming major farm owners and workers in the 20th century. 00:02:54The conservation and Preservation movements began under the direction of John Muir, Gifford Pinchot and Teddy Roosevelt and would lead to the Sierra Club, Muir Woods National Monument, and the Sierra Club. 00:01:54California Agriculture includes the California Wineries located in the Sonoma Valley and the Napa Valley. 00:01:56California's movie industry would begin in Hollywood with the movies Squaw Man and Birth of a Nation. 00:02:19This chapter examines the 1906 California earthquake. 00:01:54The Great Depression and the plight of the , Okies was chronicled by John Steinbeck, and later Hollywood would extend its entertainment reach into radio and television. 00:01:23California's irrigation canals bring water to its agricultural valleys - the Central Valley, the Salinas Valley and the Imperial Valley. 00:01:39California industries such as Douglas Aircraft and Hughes Aircraft would be used in World War II and the Cold War. 00:01:20Cesar Chavez organized the California farm workers into the United Farm Workers to help farm workers get better wages and concessions in California agriculture. 00:02:48The Santa Clara Valley, also known as Silicon Valley has towns like Palo Alto and San Jose where technology companies, such as Apple, Adobe and Cisco, created the Dot-com boom. 00:01:18In the 21st century, Los Angeles is the center of trade with and San Francisco is the financial capital of the Pacific Asian markets. Students study California climate and global warming. 00:03:25Fossil fuels have created climate change, and as a result California is experiencing climate change impacts. 00:04:43California weather and its Mediterranean climate have helped the state develop interesting pocket ecosystems, including the redwood forests and pocket ecosystems in the Klamath Mountains and the Sierra Nevada Mountains. 00:03:07This chapter examines California's oceanic ecosystems, ocean warming, El Nino, and Pacific Decadal Oscillation. 00:05:13As sea level rises, California's coastline will be affected, including its beautiful salt marshes, coastal cities like San Diego, the Los Angeles Basin, San Francisco Bay, and the Bay's levees. 00:06:33California fresh water, used for California agriculture through California irrigation in the Central Valley by way of the Sacramento and San Joaquin Rivers is dependent upon the Sierras' snow level, snow pack and snow melt to fill California reservoirs, and currently the state over-drafts these resources. 00:01:18California's Fire Hazard is made worse by the Santa Ana winds. 00:01:55California's alternative energy industry is well positioned to provide alternative energy to the state.